Used contemporary black leather meeting chairs on a chrome cantilever frame with wooden arm-pads. These comfortable, modern chairs can be used as formal meeting chairs in the meeting room or boardroom, or as breakout chairs in a less formal environment. 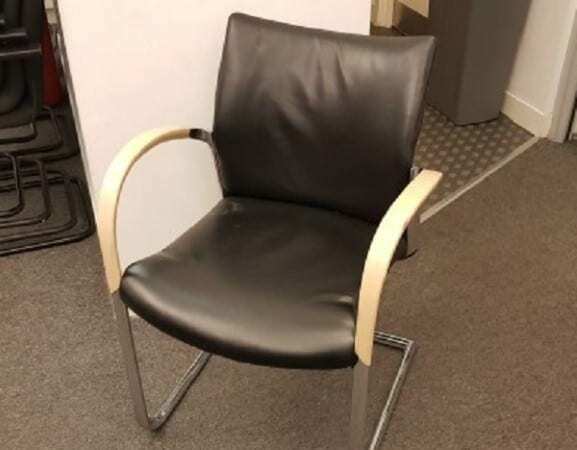 If you were unable to find the product you were looking for, we have an extensive range of Second Hand Meeting Chairs currently available in stock, all of which come in various different sizes and colours. You can view these products by clicking on the link provided. If your company is also looking to purchase a table, we currently have a number of Second Hand Meeting Tables available in stock and you can view these by clicking on the link provided in this paragraph. These chairs, along with a variety of other different office chairs, can be viewed in our showroom along with all our other used office furniture. If you see a product you are interested in, you can contact one of our sales team by calling 07944 508282. Used, Black Leather Meeting Chairs. Available to view by appointment at our High Wycombe showroom.